Basic parts needed for operation: control box, main cable, display, and UEGO sensor. HA! yeah right...like I could be brief! Anyway, as all 3rd Generation RX-7 owners are fully aware, tuning is everything. A well tuned engine is the key to performance regardless of the components installed. In my case a few years ago while on an chassis dyno some simple tweaks with the ECU yielded 20 more rear wheel Hp. On the other end of the spectrum bad tuning can lead to poor derivability, low power, and in the worst case a blown engine. With this in mind, and my ultimate goals when it comes to my car, I decided perhaps it would be wise to invest in a device that would tell me just how well, or poorly, my car is tuned. Such a device is called a wideband oxygen content (or Lambda) sensing unit. Similar to the factory oxygen sensor, found in every car, it measures the oxygen content in the exhaust gas stream. Without getting into the exact chemistry of combustion , since combustion is a result of igniting fuel and air (oxygen) the resultant oxygen content in the exhaust will tell you how much "extra" oxygen is left over after the process is complete. This indication will enable you to determine whether there is enough, too much (rich), or too little (lean), fuel being added for combustion. So why not use the factory oxygen sensor? The factory O2 sensor is a narrow band sensor. In other words it can only determine oxygen content in the exhaust gas close to what a stoichiometric combustion would produce. So those Christmas tree A/F ratio gauges seen often - I had one too - are ok for indicating something major is wrong but should never be used for serious tuning. Stoichiometric...Ooooo, big word! Stoichiometric in layman's terms is basically combustion that uses exactly the right amount of oxygen to combust the fuel added. For gasoline this value or ratio is 14.6 but it can have values between 14.4 and 14.7. So the factory oxygen sensor is perfect for conditions where stoichiometric combustion is desired, i.e., at idle. Stoichiometirc combustion is good for emissions. Also the factory oxygen sensor only operates under certain conditions where it provides feedback to the ECU to add or subtract fuel. It does not provide feedback when the engine is under load or boost. To continue, under loaded conditions stoichiometric combustion is not a good thing for many reasons. Fuel, for example, is good at cooling the combustion mixture (same principle as water injection) thereby reducing the likelihood of pre ignition. Similarly, because ignition timing is never exact some added buffer to determining fuel mixture is also a wise decision. There are also a myriad of other reasons why a richer mixture is necessary. Given that desired fuel mixtures under loaded conditions fall outside the accuracy "band" of the factory oxygen sensor a sensor with a wider accuracy "band" is needed. A wideband sensor has the ability to accurately measure exhaust gas oxygen content for fuel mixtures that are both very lean and very rich. (here for details of how a wideband O2 sensor works) So what makes the wideband and narrow band different? Well part of it is to do with the fact that a wideband sensor is heated. This provides a baseline from which the sensor can take measurements. As the sensor is measuring essentially a chemical reaction temperature correction is imperative. As such a simple narrow band sensor has one wire, a wideband sensor will have at least five. Now the sensor itself does not tell you what the air to fuel (A/F) ratio is, it merely provides an output voltage. It is therefore up to a bit of computer wizardry to convert this voltage into a useable A/F value and to do it quickly enough so that's it's somewhat meaningful. Easy...right? Not to do inexpensively. Until now! 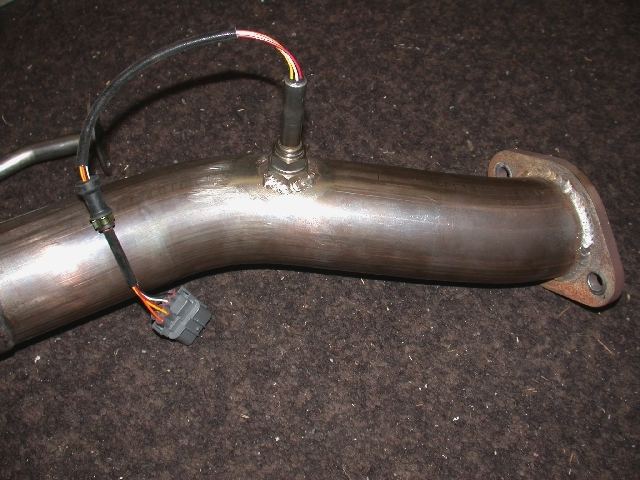 See... there's a couple of computer geeks down in Australia who also happen to be car guys who decided to put together their own wideband Lambda sensor. The control circuitry for guys like this I'm sure was fairly straightforward, the key was in finding a suitable, affordable sensor. Well thanks to Honda there is one. Apparently Honda in 1995 decided to use a wideband "5-wire" sensor in a Civic. 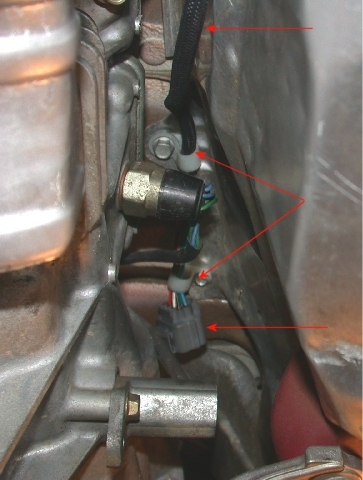 Without going into details this sensor can be found at any reputable parts supplier or Honda dealer (if in stock). Yippeee! Originally sold as a Do-It-Yourself kit, as in they supply you with a bag of parts (resistors, wires, capacitors etc.) and you solder the circuit boards together, TechEdge started selling prebuilt units recently (also referred to as the DIY OZ Wideband Kit). Yeah! I did not fancy the idea of assembling my own unit. The only part needed was for the purchaser to acquire the O2 sensor itself. Having read much about the DIY-WB on the Datalogit (datalogging software for the PFC) list I decided to buy a prebuilt kit. And the beauty of the setup is the price, I paid a total of $269.00 (including shipping from Australia) for the kit and $139.00 for the UEGO sensor. Comparable kits/units from, for example, FJO are on the order of twice this cost. The original DIY-WB version (vers 1.0 which I purchased) is currently in use by thousands. Per the TechEdge website it provides: Reliable analogue measure of AFR using the NTK L1H1 sensor (the Honda sensor mentioned above), measurement of AFR from below 10 (unleaded) to above 30 (VERY wideband! 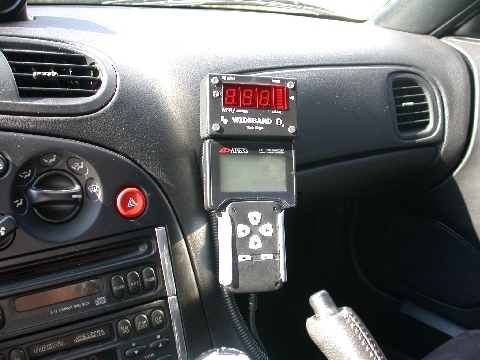 ), useable with 13.2 Volts (the car should be running), has a single red LED indicating sensor is heated and Ip is enabled, and provides a voltage output (Vout) of 1.4 (rich) to 2.5 (stoic) to 3.1 Volts (lean) and with no user adjustment and automatic calibration with sensor's recalibration circuitry. So what is it I bought? 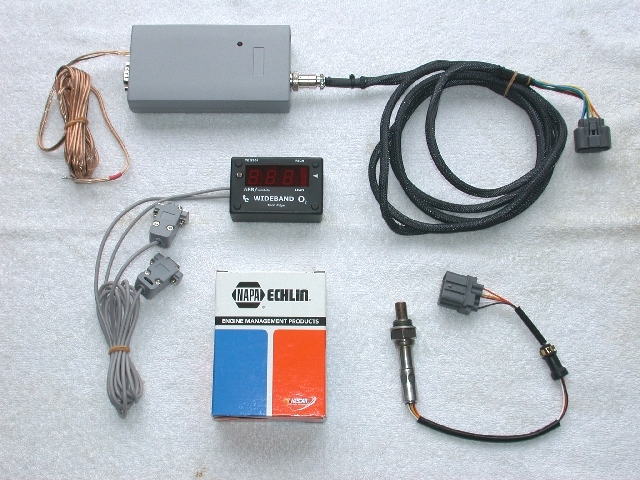 The kit (all the parts I purchased - sold individually) comes with TE-5301 Wideband LED display with RS232 aux connector (hopefully some day to be used for datalogging with the Datalogit), a 2.6 meter sensor cable (comes with the Sumitomo connector to fit the Honda O2 sensor connection), and the WB unit itself. These all arrived as advertised, all the way from Australia in about a week. The sensor (Echlin Part Number: ECHOS791) I purchased from my local NAPA for $139.00, special order - took about 3 days. And when I received all this great stuff...it sat on my workbench for 4 months! UGH! Actually I was doing some research and thinking on how to do the installation. For example the sensor is extremely sensitive to it's location in the exhaust system. Something to do with the delta in temperature between the sensor heater and the temperature of the exhaust gas. But per the TechEdge folks; the sensor should always be placed on the engine side of a catalytic converter (this one should be easy), the gas temperature to the sensor should never exceed 850 degrees C (about 1560 degrees Fahrenheit), the sensor should never be run without power to the WB unit (a hot sensor burns off carbon residues), always have the long axis of the sensor perpendicular to the gas flow (stops sensor clogging), position the sensor vertically or at most between 10 o'clock to the 2 o'clock position (this avoids cracking the internal ceramic structure should moisture condense internally) - this one would be the toughie, and a specially welded additional bung is the best mounting strategy. Sensor mounting location upstream of main cat, vertically (12 o'clock) and, perpendicular to gas flow. There was also some concern among the tuning crowd about the longevity of the sensor itself. From what I understand some of the high end(?) sensors actually have an hour rating for how long the sensors can be used before they fall out of accuracy. My thoughts, if it's a factory/OE Honda sensor rated for 50,000 miles before replacement it should last more than long enough for my needs. 1) Where to mount the display unit? It's a non standard size, it's square, and rather awkward. 2) Where to mount the sensor? Mounting the sensor vertically anywhere in the system would be a tough challenge. 3) Where to run the main cable to the O2 sensor? Heat being the primary concern in addition to routing such a bulky cable. 4) How to wire the power for the unit? Switched? Unswitched? Direct to battery or source a hot wire somewhere? And 5) Where to mount the WB unit itself? I already have the PFC ECU and the Datalogit box stuffed behind the kickpanel. To begin: 1) the only real location that would be of any use is as close to the drivers line of sight as possible. But there is a golden rule I will not break and that is that I will not drill nto my dash to mount any device. And since I don't trust vecro or double sided tape to mount the display, not to mention the cables to the display, the best location was to mount it atop the PFC Commander. Granted the PFC Commander isn't in a direct line of sight either but I found the Commander to be easily visible when on the track so the Wideband display should be also. I simply made a "tongue" out of some aluminum screwed to the back of the display unit box to slide down between the commander and the commander holder. Worked great problem 1 solved. The only question remains glare. TE-5301 WB Display mounted atop PFC Commander. Number 2) where to mount the sensor? With sensor in hand and given the Do's and Don'ts regarding mounting the sensor from TechEdge I crawled under the car. The first concern was welding a bung into my DP. Since the DP has been ceramic coated I decided not to mount it in the DP but instead found a location 6 inches downstream from the DP to MP flange. This location still being upstream of the highflow catalytic converter. This location was also the only real place I could find to mount the sensor vertically in the 12 o'clock position without any interference issues. There is at least 1-2 inches of clearance on all sides of the sensor. So I ordered a SS bolt to use as a bung and had a friend weld it on for me. BTW I was VERY anxious drilling a BIG hole in my midpipe. Number 3) Because the sensor is right next to the hot exhaust and main cat, routing the sensor cable is important. I don't feel like replacing a fried cable within a few weeks. Trouble is with the location I choose for the sensor there really wasn't a clear way to route the cable. No question the cable was long enough but how to route it from the sensor to the WB control unit. Some had suggested running it though a hole under the passenger seat but after considering this location I decided against it. One off track trip and the cable could be ripped from the car given it's exposed position at a low point under the chassis. I decided to route the cable up above the transmission and drive shaft. This required some creative wire hangers but at least it's far from the hot exhaust and relatively protected from road debris and damage in an off track drive. 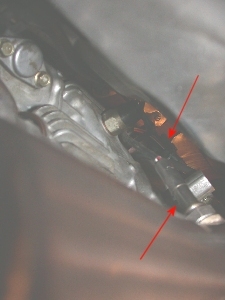 Harness routing above transmission/drive shaft. Top to bottom: harness cable, two wire "hangers," and the connector. Number 4) Two choices when powering any auxiliary device, find a hot lead in the cars existing wiring or go straight to the battery. Given some question regarding grounding issues I decided to avoid the cars existing wiring. Also given that I wanted to leave the option to run without the O2 sensor installed I needed a means to disconnect the sensor from the power source. This is easily done, lead run directly to the battery with a fuse located a few inches from the battery hot post. Power is run through a switch I mounted in a switch blank in the console. 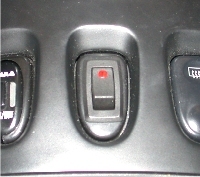 The switch has a little red light indicating power is on. The only drawback to this setup is that I have to remember to switch the WB on every time I start the car lest I burn up the sensor. Bah! With all the other stuff I have to turn on, what's one more thing? And finally Number 5) where to mount the WB control box. The solution to this one I'm nto too sure off and may require some more work but basically I stuffed it behind the passengers left foot kickpanel, secured with some velcro. Time will tell if it's sufficient. So with all the wires run and the WB up and running hopefully I will have a better understanding of how my car is tuned and how much more power I can tweak out of the PowerFC.